The Federal Reserve has softened its stance on further interest rate hikes, which means investors should reconsider the timing of the investment cycle, according to a recent report from JPMorgan Chase & Co. The Fed’s reversal means investors shouldn’t be driven by fears of recession, for a while at least. The Fed signaled last week that it’s done raising rates for at least a little while, and that it’ll be flexible in reducing bond holdings. The Fed’s changes have already been welcomed by equity investors who boosted the S&P 500 2.5 percent over three sessions, while rates traders have been working to figure out the implications of the newfound caution about shrinking the balance sheet. Demand for gold has increased as well. Apart from the immediate implications, the Fed’s adjustments may warrant changes to JPMorgan’s previous outline that investors should consider moving fully to neutral and tilting defensive in the second half of 2019 to reposition for “durable challenges in 2020,” the firm said. “If the Fed is less spooked by full employment, more tolerant of an inflation overshoot and less anxious to reach restrictive policy, then 2020 might not be a year to think about recession and so late 2019/early 2020 would be premature to position defensively cross-asset,” strategists led by John Normand wrote in a note dated Feb. 1. Cyclically oriented gauges like the S&P 500, European Autos, Chinese Equities, Topix, Emerging-Market Equities and MSCI Mining “still seem to trade as if global growth were running about a percentage point weaker than its roughly 2.6% current pace,” the report said. 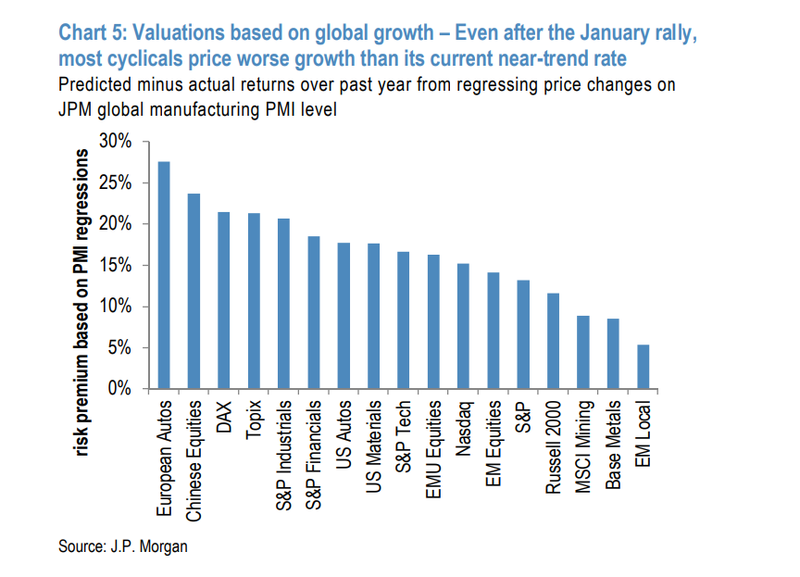 JPMorgan arrived at the figure by regressing annual returns on a PMI index, comparing actual to predicted returns, and backing out from this risk premium an implied global growth rate. « Previous Martin Weiss: Brexit and Frexit Movements Spreading Like Wildfire!